Marching, flying - death at hand? The brave must fear them both. Of wise and ancient growth. And lead them safe to open air. Richard, Orkan, and Melek slowly and carefully make their way down the mountainside until they begin descending inside a straggly forest. 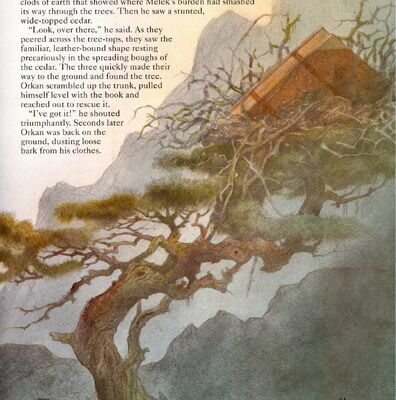 They notice signs of the lost Book of Prophecies - broken branches, fresh clads of earth - and follow them until Orkan sees a familiar leather-bound book resting in the precariously bent branches of a cedar tree. Once on the ground, the three head to the tree and Orkan reaches up to grab the Book of Prophecies. Within a matter of moments, the book is back in their possession. At Richard's suggestion, the trio reads the next prophecy. With that done, they begin heading into the forest down a valley. As they do, they hear a faint rustling through the trees. Soon, the sound picks up a noticeable rhythm, and then they hear the sounds of marching feet and brisk shouts. Orkan quickly recognizes the sound as Cozards, the Evil One's stormtroopers, and orders his friends to hide. They spot a wide crack in the base of a narrow tree and cram themselves inside the narrow space. Once inside, they wait nervously as the Cozards arrive at their location and begin marching past them. Once the Cozards have marched past, the trio wait for a few moments before they decide it's safe to emerge. Moving in the opposite direction of the Cozards through their smashed path in the undergrowth, the three head deeper and deeper into the forest. The forest around them is either dead or dying, with green foliage shriveled and trees as white as bones. Orkan comments that the forest's appearance, called Green Man Wood, is the Evil One's work - he wants the whole Ancestral World to be like this, either dead or in his power. Eventually, the three burst through the dead undergrowth into a clearing, where a giant oak tree stands, still struggling for life. They rest for a moment against the tree to regain their strength. Then Richard feels something on his shoulder; he shrugs it off as a branch. He then feels something grip his arm; he turns to Orkan and Melek, but finds that they have closed their eyes. He then feels a strong grip on his arms; Richard panics, suspecting they have fallen into one of the Evil One's traps. Then a voice calls out from the tree, saying it won't hurt Richard. Richard stands up, along with a now awakened Orkan and Melek, and they look around for the voice's owner. 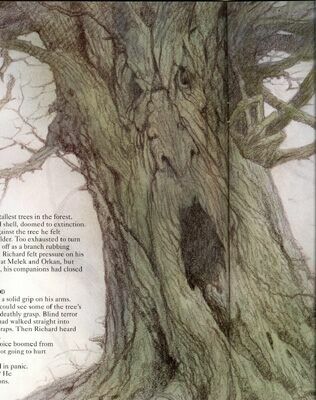 Richard then notices a face sketched in the tree's bark, a face that appears friendly. The tree then begins speaking again, saying it must pass on a warning. He warns the three about the Cozards, as well as enemy flying squads that are on the lookout for anything that movies. 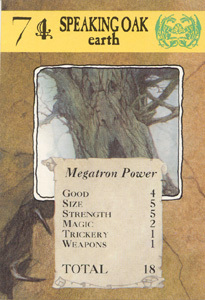 Orkan replies that they've already dealt with Grapfrits before, but the speaking oak says that there are others that are dangerous with deadly stings. Orkan whispers to his friends that the tree must be talking about the Grapfrits and that they had better leave quickly. Saying goodbye to the oak tree, the trio continue on their way. Richard mutters that they're thankful they now know what the prophecy is talking about. After a while, they come into another clearing with dead foliage all around them when Richard hears another sound inside the trees: a faint, steady hum growing in strength. Richard quickly cries out that it's the Grapfrits, and the three run. As they do, Melek looks back and sees something emerge from the trees. He motions for Richard and Melek to look as well, and they do. "Out of the trees, coming towards them like a black hand, was a huge swarm of bees. From afar, the bees looked a dark, smokey mass, but already the first scouts were edging nearest. Even from a distance, Richard could see that they looked more like huge hornets than bees. The bees' narrow bodies were marked with the pointed horn of the Evil One's mask. Some bees were armed with gigantic stings, ready for action. The drone had reached a note of shrill fury." 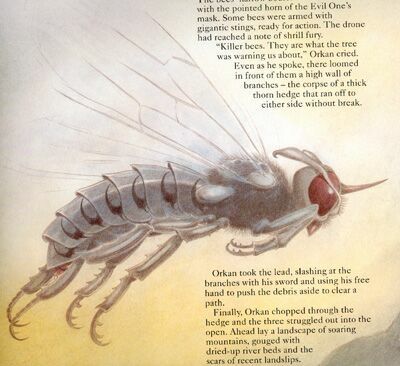 Orkan recognizes the creatures as killer bees and what the speaking oak was really talking about. 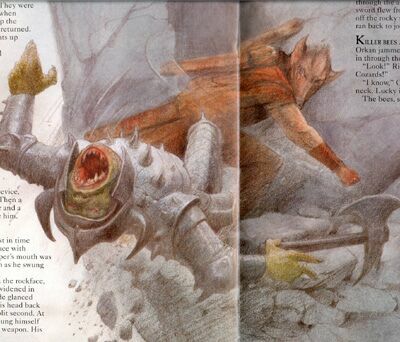 The trio run into a high wall of an endless thorn hedge, but Orkan's sword cuts them a path through it. After pushing their way through the branches, they emerge out into the open with mountains looming in front of them. Without stopping, the three head along a dry riverbed, using it as a natural staircase to climb the rockface. Just then, they hear a vicious bellow behind them - the Cozards have returned. As the riverbed peters out and the mountain grows steeper, Richard sees Golan's features above a narrow gap in the rock. He leads his friends to the gap when they hear footsteps behind them. They turn to see a lone Cozard heading straight for them. 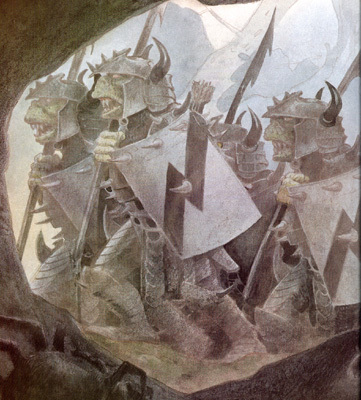 Orkan tells his friends to get inside while he faces the Cozards, drawing his sword in the process. As he does, he manages to barely avoid a spear thrown at him from below. The lone Cozard then attacks Orkan, swinging his menacing axe. The axe grazes Orkan's cheek, causing the pigman to lose his balance. The Cozard then raises its weapon for a final attack...when it suddenly lifts a hand to its neck and stumbls. Orkan takes advantage and swings his sword so hard against the Cozard that he drops his blade. The Cozard tumbles off the rocky slope, leaving Orkan to pick up his sword and join his friends inside the gap. 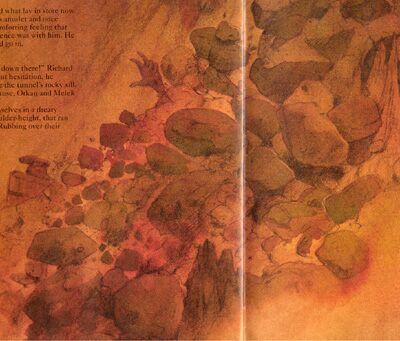 As he enters the crack, Richard points excitedly down the mountain: the killer bees are attacking the Cozards! Orkan adds that a bee had stung that Cozard scout in the neck. As the three watch, the bees, completely starved in a forest of death, find the Cozards as better pickings than the trio they had chased earlier, not caring that they Cozards are also in service to the Evil One. They swarm down on the Cozards in a giant fist, using their powerful stingers to piece the Cozards' tough armor. But the well-disciplined Cozards use their training well, forming tight boxes with their shields and keeping the insects at bay as best they can. 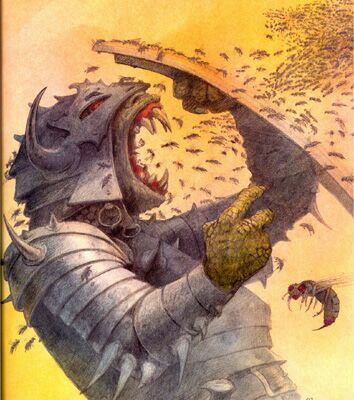 While the killer bees break through the Cozards' defenses through their weakest points, the Cozards manage to advance, leaving dead and crushed insects in their wake. Both sides are evenly matched. With the Cozards and killer bees distracted, the three head inside the gap and deeper into the mountain. They surprisingly emerge inside a dome-shaped chamber. 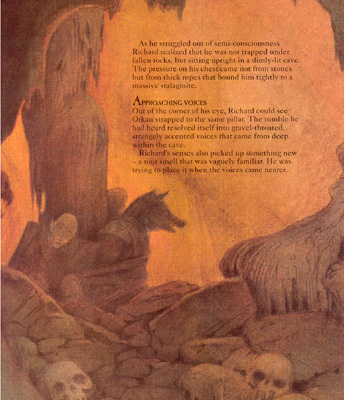 Feeling Golan's presence with him, Richard leads his companions into another nearby tunnel, taking them down a dark, low tunnel. Just then, as they press farther and farther, they hear a fearful rumbling. At first thinking it's the Cozards following them, Richard realizes that it's a rockfall! Before the three can run, the roof over their heads collapses, pinning the trio to the ground under a large pile of rocks. In Green Man Wood, most of the forest is either dead or fallen under the Evil One's control. The sole survivor of the Evil One's onslaught is the Speaking Oak. While weakened greatly from the lack of nutrients to be found in the forest, he manages to use the last of his strength to warn Richard and his friends of the dangers lying within the wood. "The roots fell away and Richard jumped up. At first glance the tree looks just like any other. Then Richard noticed a face sketched in lines of withered bark, concealed among natural bumps and creases in the wood. The craggy face looked kind and friendly." 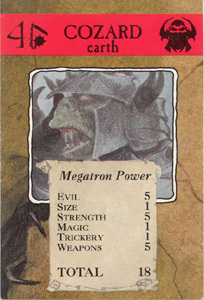 Cozards are the Evil One's stormtroopers and make up a great bulk his vicious army. In the Ancestral World, where the Evil One holds control over most of the land, Cozards are mainly used as search-and-destroy units, deployed to kill anything they find. Cozards are not incredibly smart, but what they lack in intelligence they more than make up in their ability to fight. They're also surprisingly disciplined, and in the heat of battle they're very capable of overpowering their adversaries with a range of military tactics at their disposal. "The Cozards were short and squat. Heavy armour clanked on their bodied, and from every joint there projected sharp metal spikes. They were armed with axes and barbed spears. The only vulnerable points seemed to be their faces, where steel helmets opened to reveal razor-sharp teeth, squab noses and deep-set eyes. Behind the formation, an officer bellowed harsh commands." Another thing of interest is that though Melek lost the Book of Prophecies at the end of issue five, the three recovered the book fairly quickly at the beginning of issue six wit barely enough effort. This is simply the author using cliffhangers to keep the audience coming back for more while giving a little twist on the story. In issue five, the prophecy mentioned a treasure being lost, which Richard assumed was the pod he had recovered from Baal. But the treasure ended up not being the pod but the Book of Prophecies. After that twist, they quickly recovered the book and got on with the story. 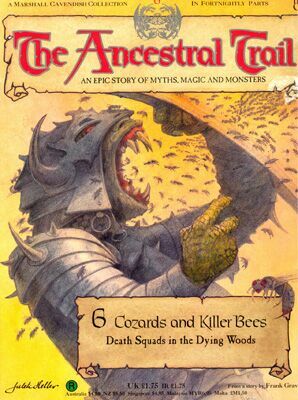 Finally, it's interesting to note that while the Cozards received a playing card, the killer bees didn't. "The Evil One's search-and-destroy units will kill anyone they come across. They're disciplined, mindless and completely ruthless." "This is Green Man Wood, and this is what the Evil One has done. This is how he'd like the whole land to be - either dead or in his power." Speaking Oak: "I must pass on a warning. I am the only survivor here. The rest of my family have fallen to the Evil One, and I have little time left myself. A few days at most. I know you are the Chosen One, and you must heed my advice. Watch out for Cozards." Richard: "We've seen them already." Speaking Oak: "Be on your guard always. There are eyes and ears everywhere now. Enemy flying squads are on the lookout for anything that moves." Orkan: "Grapfrits! We've dealt with them before." Speaking Oak: "No, no. Others that are dangerous, with deadly stings." Richard: "Look! The bees are attacking the Cozards!" Orkan: "I know. One of them got that scout in the neck. Luckily it didn't go for me."